If there were any words to sum up Diggle’s turn as the Green Arrow, that would definitely be it. After three years and a change up of his turn as Spartan, the idea of him replacing Oliver as Arrow full time is certainly jarring from a viewer’s standpoint. In the show’s world, it’s logical, but also a head scratcher, given that he literally can’t so much as aim without getting the shakes. (He can, however, take down criminals just as efficiently as Oliver and even bounce back from being Canary Cry’d into a car.) 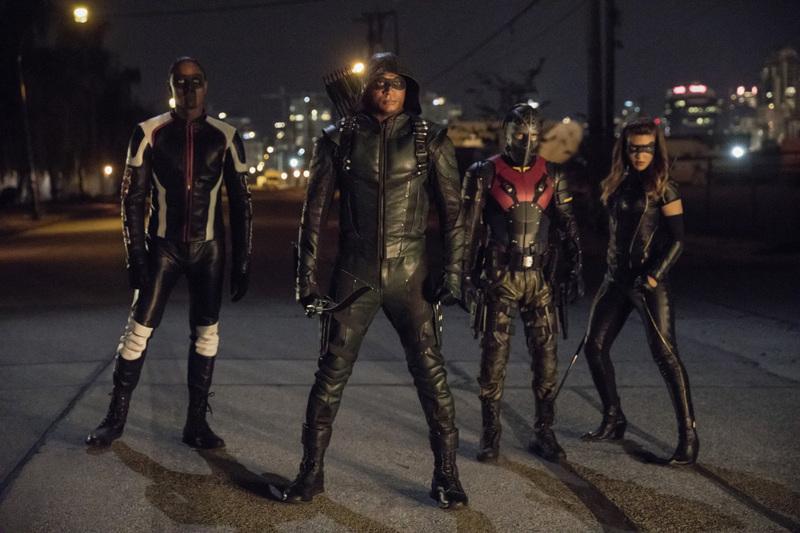 As Rene points out after Diggle’s freeze-up leads to a deadly gas explosion, the guy has no right being the Green Arrow, much less calling the shots for four other people. This is our central conflict in “Next of Kin,” as Diggle has to deal with actually being the boss instead of being the right hand. Despite being a soldier for a good portion of his life, he’s never had to actually give orders without having someone in charge of him. Even when Oliver was thought to be dead or retired, he wasn’t an official leader so much as a player in a group project. Diggle’s worst enemy on the show has truly always been himself, and it’s through a conversation with Oliver—someone with far more self loathing than him—that he’s able to really get his head in the game. Diggle spent his time early in the series as Oliver’s emotional sounding board, and in some ways, that’s what Dinah has served for Dig since she showed up last year. I’m of two minds about this—on one hand, yes, Juliana Harkavny and David Ramsey have a great rapport together and genuinely seem to enjoy each other’s company. On the other hand, it does feel like this relationship of theirs needs to go both ways. to date it’s largely been her listening to him or trying to get him to open up, giving us this weird feeling that she’s his work wife. Simply put, She needs more to do, and I hope that’s coming sooner rather than later. Last week, I noted how the show seemed more comfortable not putting so much focus on Oliver, and that certainly continues this week. Even though he’s technically retired, he’s still got to have his team’s back and deal with his own personal mess. He feels like more of a side character in his own show than he ever has, and it works without feeling like the show is keeping him around just because he needs to be there. His journey through parenthood has enough going on with both William and Felicity to be interesting enough on his own, and his efforts to keep the team from being hunted by the SCPD are also well executed. And speaking of well executed, there’s the final twist of Diggle getting rid of his tremors using drugs. This is very clearly going to backfire eventually, as all things in this show do, but it’s hard to deny that Diggle wouldn’t do that. It’s a move dictated by the character rather than the plot, something Arrow seems to be doing a lot of these days. And I can get behind it. I’m glad the show is very self aware of Dig’s archery skills and decide the best way to make up for it is just a straight up crossbow. I didn’t mention the villains of this episode, and that’s because they’re basically forgettable. They’re former soldiers looking to kill someone who double crossed them, and that’s basically it. Special Agent Watson is back, and damn if Sydelle Noel isn’t having fun shutting down all of Oliver’s excuses. Along with the Canary Cry propulsion at the start of the episode, there’s a great moment later on where the Team jumps into action in slow motion. “I’m not brooding, Oliver, I’m thinking.” Diggle says in a gravelly voice, showing that Arrow’s writers have some degree of self awareness.